Few things are more satisfying than a freshly baked cookie, still warm from the oven with the chocolate chips melting. Sounds lovely but unhealthy, right? 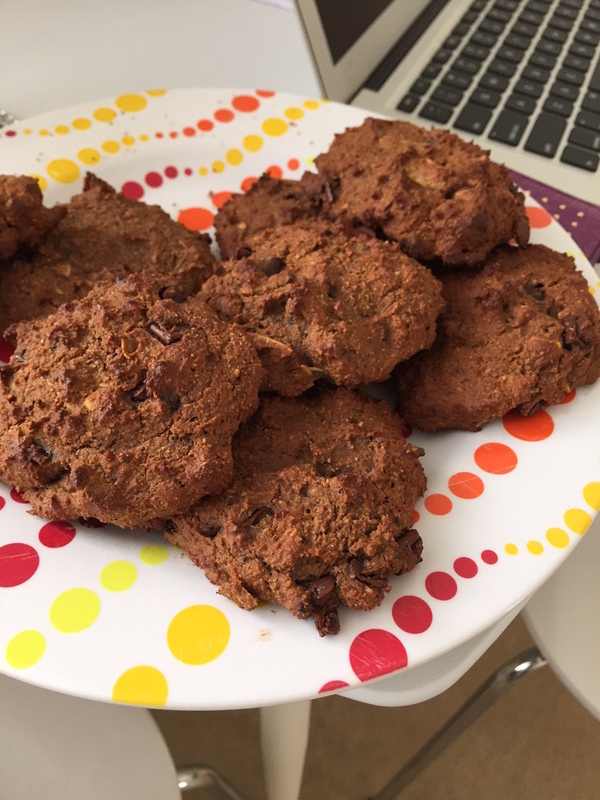 Not with this recipe – and not only are these cookies gluten and refined sugar free but they are packed with protein – brilliant for keeping you fuller for longer and repairing and growing your muscles in between workouts. You can use any type of protein powder to make these cookies, but I chose Maxinutrition Lean Whey Protein – mostly because I love the taste. 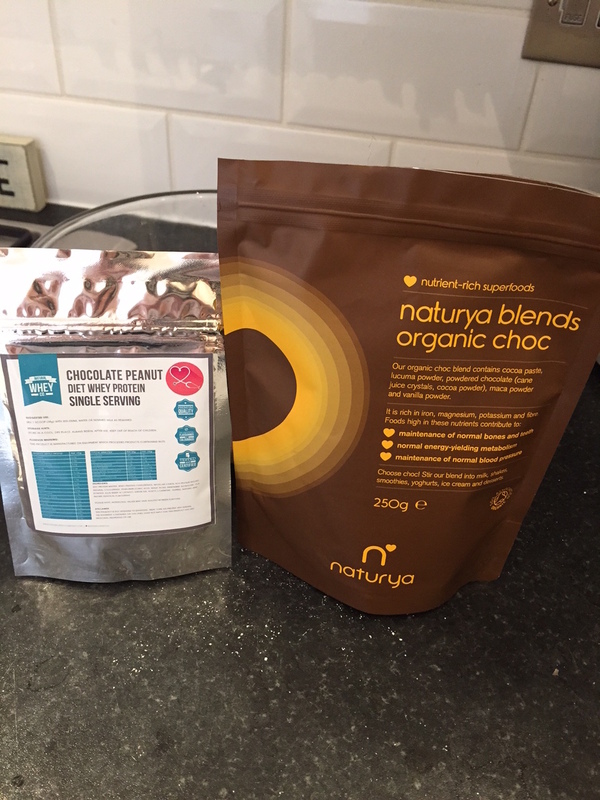 I also used Naturya‘s Organic Choc Blend to add a natural chocolate taste with no sugar, but also for a superfood boost as this versatile chocolate powder contains organic cocoa, lucuma and maca. Pre-heat the oven to 180 deg. Beat the eggs in a large bowl and add the salt to help combine the yolks and whites. Add all other ingredients bar the chocolate chips and combine until a sticky dough is formed. I have said approx. 250ml of almond milk because you may need a little more or a little less depending on how well your ingredients combine. Some protein powders are “drier” than others and may require more liquid to achieve a proper cookie dough consistency. If you want moist, american style cookies you will need quite a sticky dough. Once you are happy with the consistency of the mixture, stir in the chocolate chips and then separate into cookies on a baking tray greased with a little coconut oil. Each cookie should be around a tablespoon of mixture, flattened, and with plenty of space between each cookie as they will spread when cooked. The ingredient list above should make 8-10 cookies, depending how big you like them! Bake in the oven for 15-20 minutes and don’t worry if the cookies are still quite soft in the middle – you don’t want to overcook these otherwise they will end up being quite dry. Remove from the oven, leave to cool for 4-5 minutes and then enjoy! They should keep in an airtight container for up to 3 days. You can customise this recipe to your own taste – you could use any type of ground nuts if you prefer the taste of brazils or cashews, same goes for the milk – you can use soya, coconut, oat milk etc – whatever you prefer. The flaked coconut is an option, or you could substitute it for dried cherries, chia seeds, pecans…. feel free to get creative! If you make this recipe I would love to see how you get on (and indeed how you personalise your own cookies) so please tag me in your social media photos if you give them a go!